View Poll Results: Do you keep a round in the chamber? A Glock 43 9mm that always has a round in the chamber. Basically, that the only pistol I leave loaded 24/7, which is my carry and night stand gun. I have several more, but stored in a safe until needed. If I should pull one out to carry, than it to will have a round in a chamber/cylinder. Why, did she hit you with one? EDC is G-26 for both myself and Ms. gamboolgal. I used to carry a G29 10mm because of a limited number of round and the conceal-ability of said pistol. I needed the horsepower. Now that we passed the law (in Texas) that we can open carry I didn't have to worry about exposure (printing) that I went for a full size 9mm pistol. I love the 10mm and it's very potent but I'm getting too old for this. I'm also disabled so I had to compromise. I got me this fantastic pistol, the Beretta PX4 (after I sold the G29) and I replaced the springs to handle hot 9mm loads and an easy trigger. My trips to the range has shown that I'm covered. This is this morning. 5 rounds of 10 shots for a total of 50. As you can see, it gets tiring pretty quick (for me). This is at 10 yards. One in the chamber is the only way for me. I DO NOT want to have to take any unnecessary steps if/when I need to defend myself in a life or death situation. Doesn't matter which of my EDC seasonal rotation handguns I'm carrying. If it's loaded, it's chambered. I have no intentions of changing my ways. I will also add that we are a retired couple, with no children in our home. The WALTHER P99 AS (and the compact version), are in my opinion, the "perfect" pistol for a variety of reasons. I prefer the DA/SA mode, with a round in the chamber......achieved by pressing the decocker button, thus putting the trigger system into the DA mode for the 1st shot. With a green laser/800 lumens flash light unit mounted, it is the perfect night stand pistol. 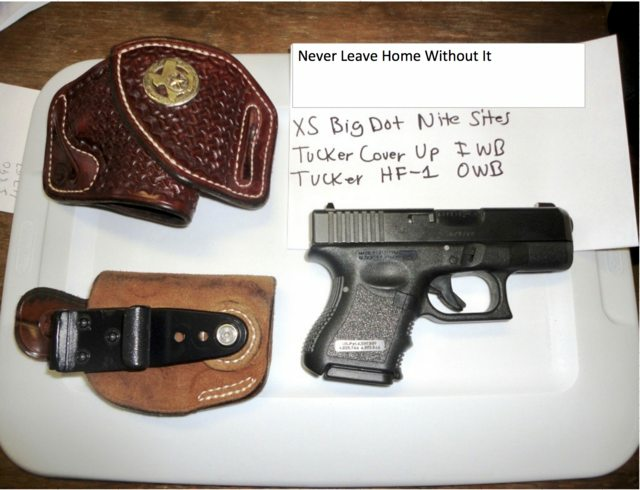 It can be carried effectively as an EDC either way.........obviously it is slightly more difficult to conceal for EDC with the laser/light mounted. ..However I found a holster made in Isreal that works out quite well for EDC with the laser/light mounted. Being in my 87th year and having owned and shot approx12 different hand guns in the last 74 yrs, this Walther IIHO, is the best of the bunch!! Love my P99C and a fan of DA/SA pistols and revolvers in general. I'm just not comfortable carrying a SA only handgun. Mine are always ready to rock. Depending on my mood, I may be carrying a Remington 1911 R1 Enhanced, Glock G27 with a 357 SIG barrel, or .40 S&W M&P Shield. 3. Fla. Stat. § 790.174(2). See also Fla. Stat. § 784.05 (holding an adult culpably negligent for storing or leaving a loaded firearm within the reach or easy access of a minor, if the minor obtained the firearm and used it to inflict injury or death upon himself or herself or any other person, unless: 1) the firearm was stored or left in a securely locked box or container or in a location which a reasonable person would have believed to be secure, or was securely locked with a trigger lock; 2) the minor obtained the firearm as a result of an unlawful entry by any person; or 3) the injuries resulted from target or sport shooting accidents or hunting accidents). ⤴︎"
It is interesting that the actual statutory reference is only in the fine print footnotes. One could almost infer that they don't want people to know the law, they just want people to take their word for it. Many states do not have such laws. Montana doesn't, for sure. Florida and Montana both get an "F" in their rankings. No round in the chamber- it's a paperweight.